I’ve started assessing and packing up some stuff – I’m planning on doing a slow move, with most of the important stuff (yarn) in plastic bins and some baskets. I’ve got the spinning stuff down to a single bin plus the wheels, fabric is all in one bin as well (plus the serger). Yarn? That’s more than one bin! Um, way more. But I’ve packed up pretty much all the loose skeins now so all of it can really just be put in the car and moved. And I’ve been knitting a bit, but not much – this little cardigan needs just about an inch of sleeve ribbing. Sheesh! I love the smocked ribbing around the body. 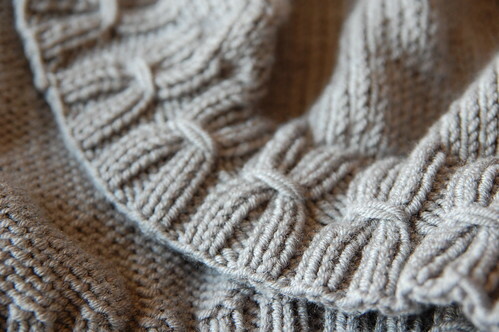 That smocked ribbing is sweet! Will we be seeing a pattern for that? I love your sleeve trim. I will have to remember it the next time I want to make a tweak to a pattern. i agree with seanna lea – the sleeve trim is wonderful. i can’t wait to see the whole pattern.